(Concord, NH) The New Hampshire Division of Parks and Recreation, Bureau of Trails announces that the Recreational Trails Program (RTP) grant applications are now available. RTP is a competitive grant program that offers funding for quality public trail projects throughout New Hampshire. Limited grants are available for motorized, non-motorized and diversified trails. Eligible projects include maintenance and restoration of existing trails, purchase and lease of trail construction and maintenance equipment, construction of new trails, development and rehabilitation of trailside and trailhead facilities, trail linkages, and acquisition of easements or property for trails. Applicants may be non-profit organizations, private groups or government entities. Applications are due March 7, 2014. For an application and more information, visit the Partners & Community Resources page at www.nhtrails.org. Funding for the Recreational Trail Program is generated from federal gas tax dollars paid on fuel purchases for off-highway recreational vehicles and snowmobiles. These funds are appropriated to the states by the Federal Highway Administration as authorized through the Moving Ahead for Progress in the 21st Century (Map-21) Bill. The program in New Hampshire is administered by the Bureau of Trails. The Bureau of Trails is one of four bureaus in the Division of Parks and Recreation. The Division is comprised of the Bureau of Parks Operations, Bureau of Historic Sites, Bureau of Trails and Cannon Mountain. The Division manages 92 properties, including state parks, beaches, campgrounds, historic sites, trails, waysides and natural areas. The Division of Parks and Recreation is one of four divisions of the Department of Resources and Economic Development. To learn more, visit www.nhstateparks.org or call 603/271-3556. 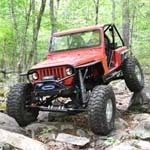 Did the Jericho Mountain legislation contain an appropriation for the cost of constructing the 4x4 trails? If not then perhaps a grant to help offset the cost? Is there anything at Swanzey that could meet the requirements for RTP funding? Receiving RTP monies, we would need landowner approval/permission. The NEA does not have this so LMFT would need to apply for the grant. NWOR could apply for these but I am not sure what the current status of this project is. I walked some trails with NWOR in the Spring but then I dropped off with my wedding. There was some confusion at the time on where the boundaries were. I plan on working on a grant for Jerico as soon as the project advances to that point. Right now, we are still waiting on Trails Bureau permission to start trail cutting. Typical diplomatic process, hurry up and wait. As of this winter, our only expenses has been a few rolls of marking tape. If anyone is familiar with writing up these grants , please drop me a PM with some direction. I am sure Trails Bureau will dictate the expenses when they lay/approve out the trails. Culverts, bridges, etc. Once these expenses are found, writing the grant isn't going to be hard. They have grant writing classes but it doesn't look like any grant will be written for 2014 if things haven't moved past the marking of the trails. Is a grant possible for the money we are spending to improve Swanzey? If the work is being done in 2013 you cannot retroactively request grant monies for the previous year.